Perhaps not an online gambling slots game for the die-hard sprite fans out there, but surprisingly this has absolutely nothing to do with the drink. Nevertheless, it remains a lovely little fruit based three reels that will see you spin your way through minimalist oranges and grapes. Play 7 UP today and win yourself some handsome cash rewards. Don't forget to check out slots here! Only established in 2010 and already Endorphina is standing out in the very competitive online casino industry. Located in the beautiful historic city of Prague in the Czech Republic, Endorphina is a slot gaming developer that has become renowned for creating fun and innovative online slot games played in online casinos around the world. It is in their mission statement to thrill and excite all its slot games players and in 2015 this new company won the award for Best Online Slot developer. 7 Up! 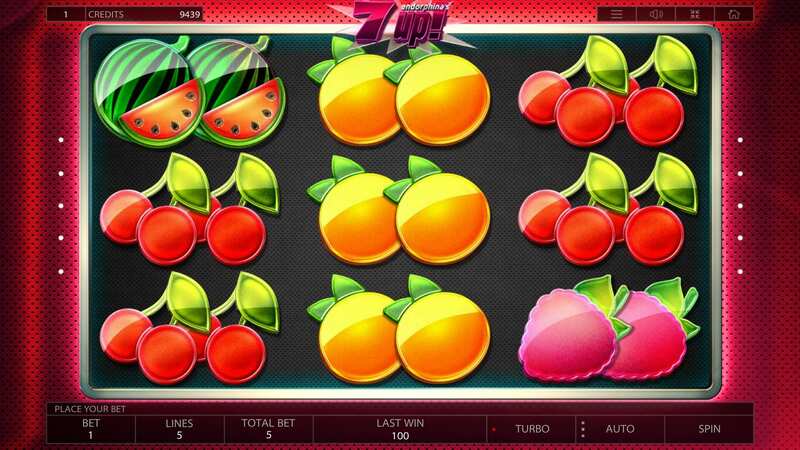 Is an exciting take on the traditional fruit machine, and regarded to climb to the same level of top-rated online slots. With its bright neon colours, dynamic background and funky upbeat soundtrack, this online slot game bursts with energy and vibrancy. This game comes with 3 reels and 5 paylines with a RTP (Return to Player) of 96%. As you would expect from a traditional fruit machine the reels are decorated with familiar arcade symbols such as cherries, lemons, oranges, strawberries, grapes and watermelons. You also have the Golden Stars, bar icons and of course 7s. Don’t be fooled by the simplicity of this online slot game, despite its retro theme this game is not old-school. The gameplay is straightforward giving everyone the chance to win multipliers up to a whopping 200x their line bet on every single spin of the reels, you will soon realise that it’s not just the high definition graphics and vibrant colours that will catch your eye. You can set your credit value from 1p to a maximum of £1 per credit, making your maximum bet stand at £50. This flexible wagering ability means that this online slot game is suitable for beginners and high rollers alike. There are no Wilds or Scatters in this online slot game, however, you will trigger the 7 Up Bonus you need to land 9 symbols of a kind on the reels. In this bonus, you will get 7 Free Spins to achieve a 7x multiplier to apply to the triggering prize. If during the Free Spins you don’t find the coveted 7x multiplier during this bonus feature you will still receive a prize for each unsuccessful spin. 7 Up! Also includes a Gamble Feature where you can gamble your last winning round to double it. 4 cards will be presented to you faced down, to win the Gamble you need to choose a card with a value higher than that of the dealer’s card. The risk is that you can’t be sure that there is a card there whose value is higher than the dealer’s, but if you get a Joker you win as this beats all other cards. The Gamble is over when you decide to collect your winnings from the table, but if the dealer’s hand wins you will lose all your winnings from both the minigame and from the last winning round, so be careful as this Gamble Feature can be highly volatile. 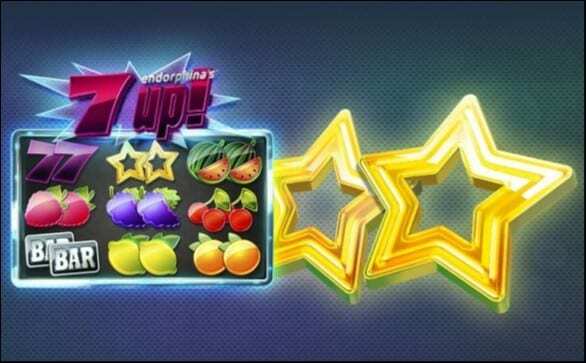 Endorphina has created no ordinary fruit machine with 7 up! It is refreshingly straightforward with some stunning graphics and amazing multipliers. This game is suitable to online gamblers of all levels making this online slot game a keeper. Like this? Then try our call of the colosseum slot too.